The reason why I'm doing a double review instead of the two as single reviews, is because I first saw these back in 1988 as a three double feature Halloween Marathon. There was an all-night Drive-In movie marathon at the local Drive-In, and these two played on that Halloween Three Day marathon, and so I thought it would be fitting to display them together. Twilight Time Blu-ray has released both on a special edition Blu-ray of 3000 units produced. Both of these films have never looked any better. Never sounded any better. There both crisp in imagery, clear in sound. Both vibrant in color. Both are truly classic films in a sense of the Drive-In B-grade adventure. These are films that should be seen, and respected for giving fun, cheesy entertainment. It doesn’t surprise me that neither of these have had a Blu-ray release until now. So many films classified as B-grade Horror or Sci-fi never get the special treatment that so many deserve. Thankfully there is a growing film lover population for these Drive-In films. Twilight Time did a lovely job in mastering new outlets for both of these films. I thankfully grew up during a time of the 80’s, and even the early 90’s consisted of late night movie marathons at local theaters, or still remaining Drive-In’s. Now these two didn’t play back to back in my 1988 adventure, what it was, was a Halloween Celebration over a three day period. The lineup was, Texas Chainsaw Massacre, Scream and Scream Again, Dementia 13 on the first night. Second Night was Attack of the Killer Tomatoes, followed by The Rocky Horror Picture Show, Carnival of Souls. Third night was Strange Invaders, followed by Night of the Living Dead. It’s was a great three nights, and so that is why I am doing a double feature review for these two Drive-in style films. First up is Scream and Scream Again. Starring three masters of Horror, Vincent Price, Christopher Lee and Peter Cushing. Price, Cushing and Lee need no introduction to anyone calling themselves a movie lover. All three were the very definition of performance in no matter what role they played. From drama, to horror, they were the gurus of cinema. Most fans flock to their horror films as there trademark, but Price, Lee, and Cushing were so much more than just horror actors. Prince, Lee and Cushing were skilled thespians. In Scream and Scream Again, this science fiction/thriller/ horror, is an anthology of skits. Price plays Dr. Browning. Lee plays the character of Fremont, and Cushing plays the character of Major Heinrich Benedek. Three separate stories. A jogger in London grabs his chest. He soon wakes up in a hospital, and the truth of horror begins. Konratz who is an official of a Totalitarian state returns home, and his horror begins. Detective Bellaver investigates some women’s strange deaths, all drained of blood. Each of the stories come together to complete one final climax. A great mix of horror, strange, and twisted ideas, that give the viewer a fine dose of classic Drive-in style entertainment. Also starring the wonderful Alfred Marks, Michael Gothard, and many wonderful others that bring this spook filled flick to creation. Directed by Gordon Hessler.Hessler is also another one of those film makers that really needs no introduction. He has directed some of the most memorable Drive-in style, horror, murder mystery films of all time. From the overlooked gem, 1969’s The Oblong Box, 1970’s Cry of the Banshee, 1971’s Murders in the Rue Morgue, and many others. He was talented in creating thrills, spooks and chills, classic style. that has plagued this film is many categorize it wrong. Many just push it off as another horror, sci-fi film, with the three horror actors. The movie is in reality so much more. It’s more a science fiction film then anything. There is a darker reality based understanding to its plot then most of these style of films. Scream and Scream Again is a conspiracy theory film that is worthy to be praised for its ultimate odd message. Twilight Time did an absolutely fantastic job in bringing this film out. Highly recommended. Next up is Stranger Invaders. A totally different film then Scream and Scream Again, yet all Drive-in Science Fiction at its B-grade fancy. This 1983 film paid respect, and honored those films of the 1950 science fiction nature, of alien invaders, and spaceships from the stars. The plot plays out like all those classic science fiction films. The setting is 1958 in Centerville, Illinois. Aliens invade, and turn people into glowing blue orbs, and alter themselves into those they captured, or killed. Flash forward 25 years, and your main character, University Lecturer Charles Bigelow has learned that his ex-wife has gone missing while attending a funeral in Centerville, Illinois. As you would guess it, he sets out to find her. Now when Charles arrives, he is quite shocked to find the town seems frozen in 1958. The surroundings, atmosphere, clothes, cars, and everything looks like the 1950's. So begins Charles journey, and his plight to find his wife, and also fight against those aliens who wish to capture him. This film is wonderful, campy fun. A great b-grade, cheesy wonderment to enjoy. Directed by Michael Laughlin. This was actually supposed to be part of The Strange Trilogy. Laughlin had directed the Drive-in classic, 1981’s Strange Behavior which is also titled as Dead Kids. 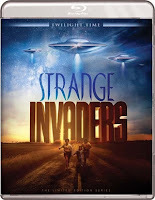 Strange Behavior was part 1, Strange Invaders was supposed to be part 2, but because it failed at the box office, the third installment was never made. Both stand alone as movies, but was supposed to be three films with the title Strange. Each installment was something strange, Strange Behavior, Strange Invaders, and sadly Strange, whatever, it never came to light. Strange Invaders has a basic ensemble cast of 80’s actors. The wonderful Nancy Allen, she plays Betty Walker in Strange Invaders, she is famous for her role in The Robocop movies. Also starring the beautiful Diana Scarwid who gives a great campy performance in this. The amazing Michael Lerner, which might I add has acted in over 170 performances? Also starring a true, personal favorite of mine, the one and only, amazingly talented and pure perfection in performance quality, Estelle Louise Fletcher. She will always be Nurse Ratched. She played some of the greatest, mean spirited characters. She is perfection. Your main character, is played by, the much underrated, and often overlooked, Paul Le Mat. I have always felt he never got the limelight he deserved, even though he has won many awards. Many will know him from the 1973 classic American Graffiti, which might I add he won the Golden Globe Award for New Star of the Year. He also won his second Golden Globe for Actor in a Supporting Role in a Series or Mini-series, for the film 1984’s The Burning Bed. I think he is a wonderful actor. He has a true natural talent. Strange Invaders is a throwback to the golden days of science fiction. This is a true homage of all the space ship, and alien invasion films of the golden days of the 50’s drive-in flare. Twilight Time did a wonderful job in picking this old school treat for a new generation on a wonderful blu-ray product. This product showcases a continuing odyssey of respecting forgotten pieces of cinema. As long as there are companies like Twilight Time to respect forgotten cinema, b-movies, low-budget films, and cult status cinema, then the movie loving world is fine. Strange Invaders, and Scream and Scream Again belong at the drive-in. Sometimes the films at the Drive-in are truly cheesy, wild, over-the-top. From drama, action, sci-fi, horror or exploitation reality. Sometimes awesome, sometimes awesomely bad. With these two Blu-ray’s all I wanted to do was Grab the popcorn, the extra-large pizza, the soda pop, and rock down to the classic Drive-in. Sometimes a brilliant film, and others times, a cheese covered movie bliss, and wild orgies of "oh my god did I just watch that". That is the beauty of Drive-in cinema. Cinema that maintains pure entertainment. Twilight Time is a company that shines and brings the beauty of entertainment to amazing products. This double feature Twilight Blu-ray style made me sing that classic tune: "So let's all go to the lobby, let's all go to the lobby, let's all go to the lobby, and buy ourselves a treat". Has never looked any better. I own both the VHS and the DVD. This blu-ray is high class quality. There are moments of imperfection but for the most part the quality is Crisp. Vibrant, and pure perfected imagery compared to the other releases. I thought Twilight Time did an amazing job with the transfer. I have seen this on the theater, VHS and DVD, I own the DVD. It has never been this clear. Twilight Time did a wonderful job on this transfer to Blu-ray I think this is a truly remarkable example of perfected care toward Blu-ray products..
Isolated Score Track. The music was done by the English composer, songwriter, conductor and other music related talents by David Whitaker. He was a true eye opening, multi-talented music man that worked with so many wonderful artists. From The Rolling Stones, Jimmy Page, and so many others. He left a world of music. Twilight Time honored this music genius with a lovely special feature of his isolated music. A grand listen for any lover of music scores, or music period. Audio Commentary with Film Historians David Del Valle and Tim Sullivan. This was a great listen. Love to hear Film historians talk about movies. David Del Valle knows his stuff, perfect listen. Also was utterly awesome and downright memorable to hear one of my favorite Drive-in directors on this, none other than Directer, Tim Sullivan. Sullivan is pure genius of Drive-In Horror’s that have become cult films, and this lover of Drive-In cinema, loves Tim Sullivan. Sullivan is pure brilliance. A great listen. Gentleman Gothic: Gordon Hessler at AIP. This is a little over 23 minute program that deals and talks about the director’s ordeal with the studio. A really great watch. An Interview with Uta Levka. This was a true treat to hear from one of the actors on the film. A great bonus feature. Isolated Score Track: The music for this film is done by a British composer who was a truly gifted musician. John Mervyn Addison was an award winning composer that left many wonderful film scores under his belt. He won an Academy Award and Grammy Award for Best Original Score for the film 1963’s Tom Jones. He also won a BAFTA Award for the wonderful music score for the amazing World War 2 movie, 1977’s A Bridge Too Far. He was a gifted talent that left many countless examples of music bliss, from TV, to Feature Film, to everything in-between. Twilight Time did a wonderful job giving this isolated music track as a special feature, and in honor of this music talent. Audio Commentary with Director Michael Laughlin and Writer William Condon. An awesome listen. I really enjoyed listening to this commentary because of the director, and writer of the movie both shared great knowledge of this classic Cult Drive-in film. Hearing them talk about the movie is a great special feature. This is the first time I have listened to this commentary. This commentary was also released on the MGM Midnight Movies DVD. Two wonderful examples of Drive-in, campy, wonderment's of Cult following reality. Twilight Time did a truly fantastic job on the transfers. Beautiful examples of two must own, must experience blu-rays. Twilight Time did it again, and satisfied my Drive-In, B-movie loving heart, with two golden, late night, midnight style, and Popcorn Entertainment flicks. Perfect Blu-rays. Awesome transfers. Dynamic bliss. Pure Drive-in excellence.